It part two of three of Harry Potter and the Sacred Text. 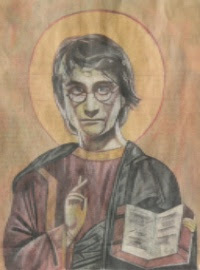 Although Harry Potter is a secular text it has had an impact on our culture. We will engage the book with some approaches to reading sacred scripture. This Thursday Amanda Northrup and Pastor Bill will dive into Fear: Letters from No One (Book 1, Chapter 3). Come to worship in your best Hogwarts attire. 8p at Wesley Student Centre, 1118 S. Harrison Road.